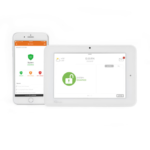 Home / Topic / What is Alarm.com Wellness? DIY Home Security › Forums › Support › What is Alarm.com Wellness? This topic contains 1 reply, has 2 voices, and was last updated by Tyler 8 months, 3 weeks ago. What is the Alarm.com Wellness add-on? Wellness provides insights into daily activity and routines. Using behavioral baselines, this solution helps spotlight unexpected activity and trends that are out of the ordinary, which may lead to emergent issues. It is ideal for tracking Unusual activity, Nighttime safety, Up and About status, and Fall Detection. In addition to the Door Sensors, alert pendants, and Motion Detectors you may be familiar with, Pressure sensors can be utilized to detect when a user is or is not sitting or resting. Chair Sensors can be used to determine how much time the user spends sitting and Bed Pressure sensors can be utilized to determine when the user goes to bed and gets up. Alert buttons can also be utilized in high fall risk areas as well, giving the user the opportunity to send a panic signal in the event of an emergency. Wellness offers the ability to closely monitor the activity in a location so that you can know exactly what is happening at all times. A blue line indicates a sensor being activated. Hovering your mouse over the blue line gives the specific time window of the activation event. A yellow line indicates that a sensor alert (notification) was sent. A red line indicates that an emergency button was pressed and an alarm was activated. The status box next to each sensor updates in real time to show the current status of the sensor. You can toggle between Activity by Sensor and Room via the dropdown. The Behavior Tab gives the user insight into what an average day looks like at home. You can view daily activities to spot irregularities in a daily routine or look at a trend view to spot emerging behavioral changes. In addition to the activities view, Alarm.com will keep track of events over time and create averages that are displayed on the Behaviors page. These averages allow you to compare activity of a single day with a standard activity pattern. If the user’s behavior falls outside of the average, it will be noted in yellow or red on this chart. This will help to identify variations in sleep, movement or restroom visits that could indicate a decline in user’s health. The trends view allows you to see the typical high and low points throughout the day for each sensor. This allows you to see what is normal activity and what might be abnormal activity. You can toggle between Trends and Behaviors via the dropdown.